Is there hope for another season of Marvel’s Agent Carter? The stars of the cancelled ABC series have recently said they’re interested in a third season, both Radio Times and Digital Spy report. Earlier this month, ABC cancelled the Marvel drama after two seasons. The show starred Hayley Atwell, James D’Arcy,Enver Gjokaj, Chad Michael Murray, Wynn Everett, and Reggie Austin. Since news of the cancellation broke, fans have launched a petition for Netflix to save the show. So far, that petition has gained more than 100,000 signatures. What do you think? 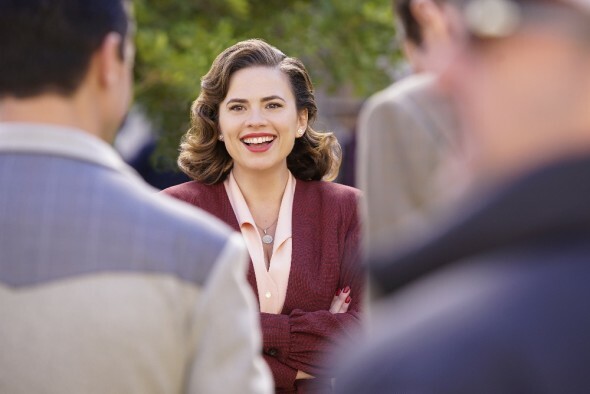 Are you a fan of Marvel’s Agent Carter? Do you want a third season? Yes I love the show. Great production. Not fair that we can’t see more. Someone with the right leverage needs to listen. There certainly is a demand for Agent Carter. Yes, yes, yes! More Agent Carter. Love the show. A big YES on season three of Agent Carter !! I have great faith Netflix or Amazon will step up and save the day. YES, YES, YES ~ Please bring Agent Carter back, such a FUN SHOW!! Loved all of the characters, which is rare!